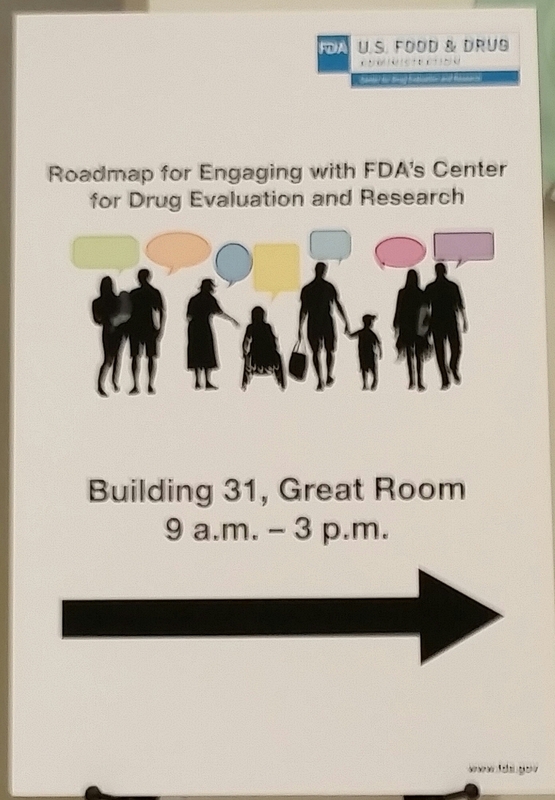 FDA Workshop: Engaging with FDA in the drug approval process. Between Diabetes Blog Week and being away on vacation for the past week, I never got a chance to tell this story. 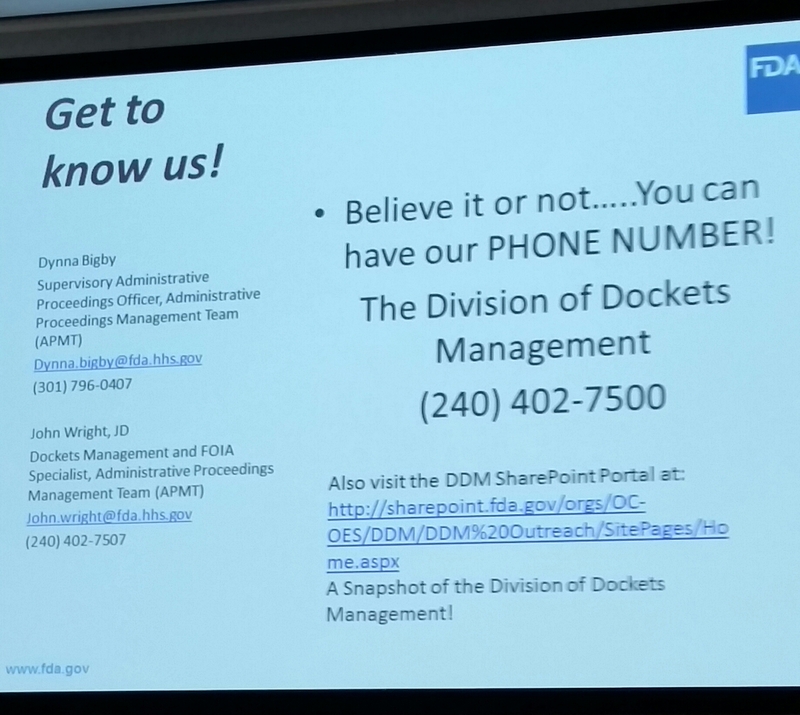 At this workshop, I was reminded once again that FDA officials speak using an alphabet soup of acronyms: CDER (Center for Drug Evaluation and Research), PASE (Professional Affairs and Stakeholder Engagement), DDM (Division of Dockets and Management), DDT/COA (Drug Development Tools Clinical Outcome Assessments), OHCA (Office of Health and Constituent Affairs), OSP (Office of Strategic Programs). 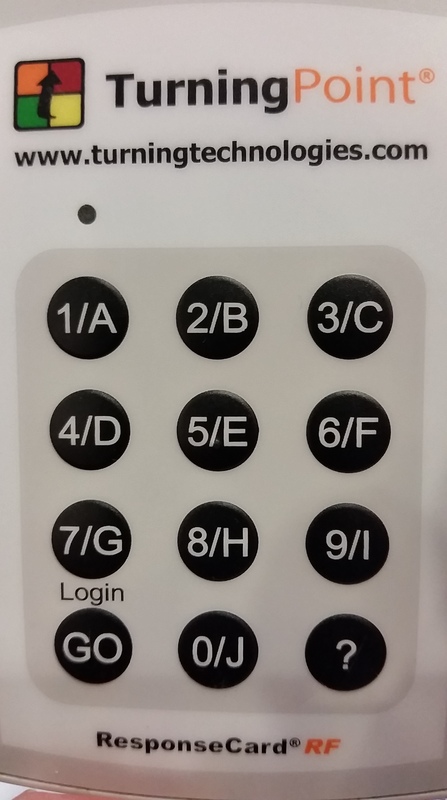 Fortunately, the presenters, though heavy on acronyms, didn’t rely on them to convey their messages. 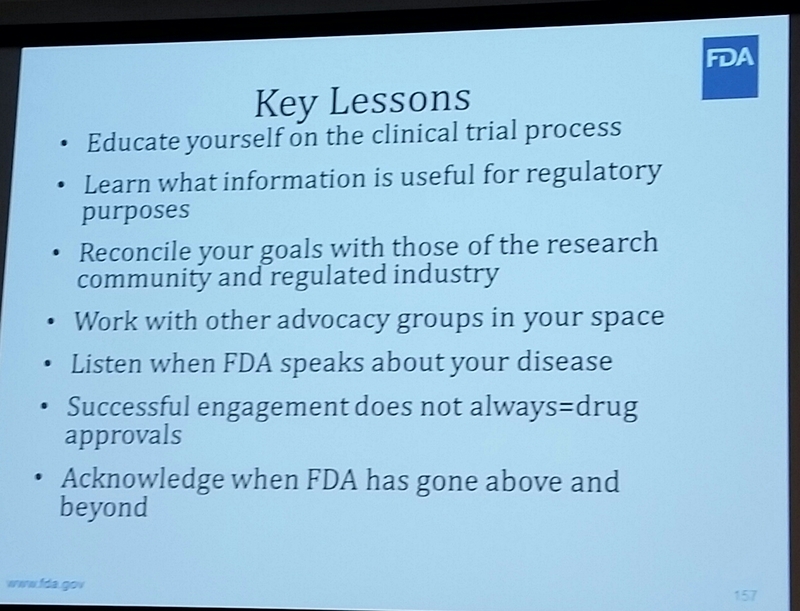 And the messages were significant, with a huge amount of information provided on what to know and how to engage with FDA regarding drug approvals. Want to know about diabetes drug approvals that did or did not happen? There’s a way to do that. Want to hold a meeting to bring patients together and invite the FDA to take part? There’s a way to do that. Want to stay informed on the latest news? That’s right… there’s a way to do that. So, what was covered? A number of subjects, including the entire drug approval process, from start to finish. We learned how to “Rock the Docket” and use the Division of Dockets Management to research what’s happening in drug approvals that might affect People With Diabetes. 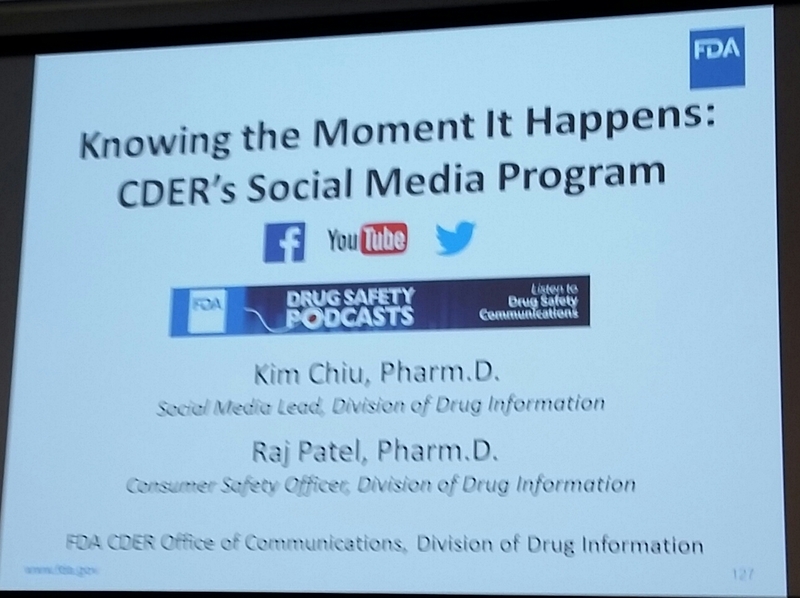 There was an entire presentation on the various ways that FDA, and CDER in general, interact via social media. And there were several interactive moments between FDA and attendees themselves, including question and answer sessions after presentations, and a chance to answer questions about presentations just concluded. Questions like “After this presentation, I am A) Not very confident about explaining the drug approval process, B) Somewhat confident about explaining the drug approval process, or C) Very confident about explaining the drug approval process”. After lunch, there was a round of FDA Jeopardy. My team finished second out of four, but unfortunately, no prize money was awarded. There were also a couple of presentations from representatives of patient communities who have had success interacting with FDA on drug approvals for medications that have helped the patients they represent. I have to say that at the end of the day, I felt like the Center for Drug Evaluation and Research has a good handle on what they do, how important their mission is to people living with chronic conditions, and a valid social media strategy that keeps patients informed. I was grateful to attend this workshop, and I walked away with a few new contacts from other patient organizations too. Not a bad way to spend my day off. **To look at meeting presentation decks and order a transcription of the meeting, CLICK HERE. 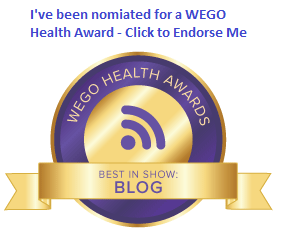 « Diabetes Blog Week: More than Diabetes. I think that when any organization that does feedback while they are doing a presentation rocks. That sounds like a fun day (sort of). I learned a lot about the drug approval process, how to research diabetes-related approvals and documentation, and how to interact with the Center for Drug Evaluation and Research. Thanks!